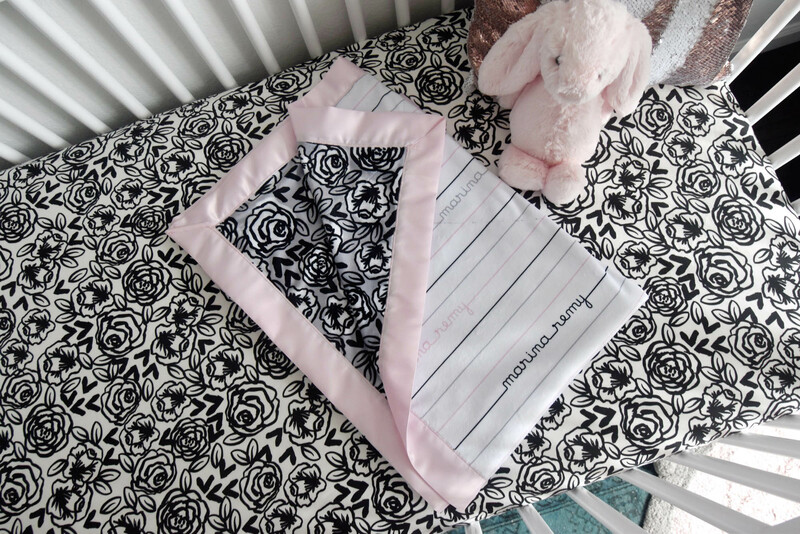 Stefanie: Making your own custom baby name fabric is such an easy way to personalize your nursery or make a sweet custom gift for an expecting loved one. 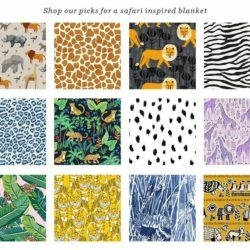 I make custom reversible baby blankets for all my friends’ babies using Spoonflower’s Minky fabric, and everyone always loves them! 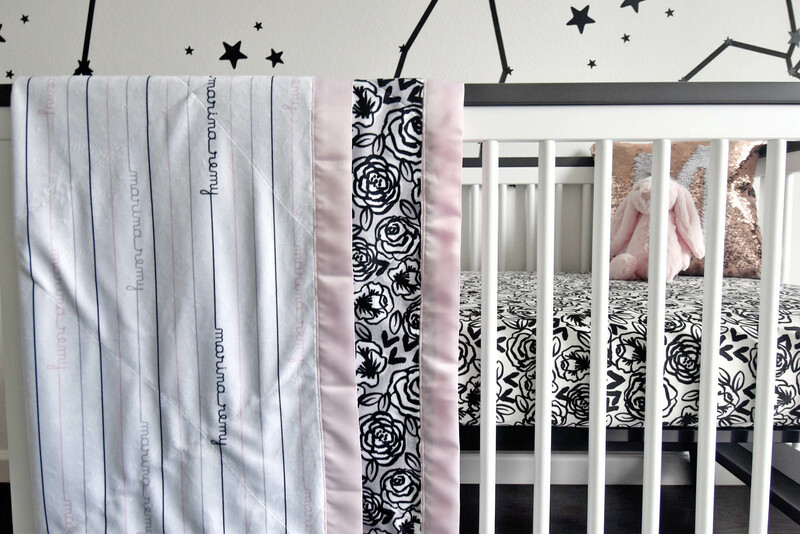 Get creative with your custom name fabric and use different fonts and fabrics to make crib sheets, wallpaper, pillows and more to really personalize a space. Download a fun cursive font of your choice and get it loaded up into Photoshop. 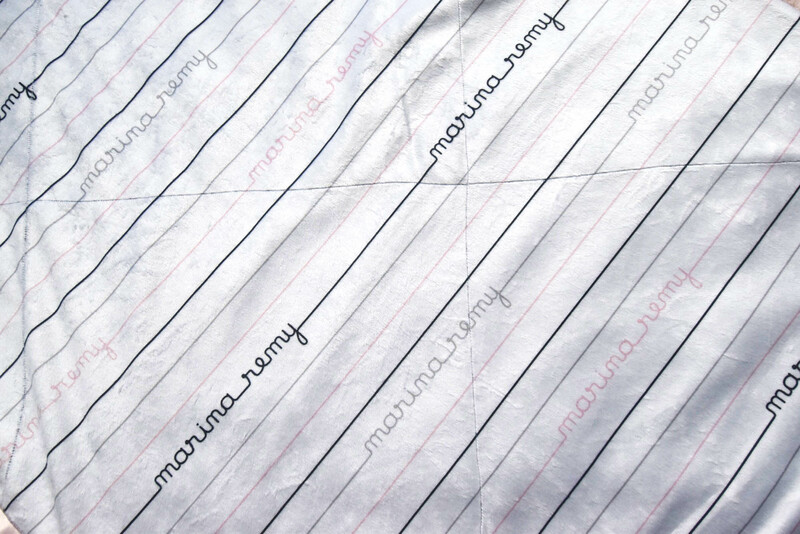 I find lots of free fonts on DaFont.com such as Mamae Que Nos Faz by Rafael Pereira. Important Note: Many sites offering free fonts are for personal use only! 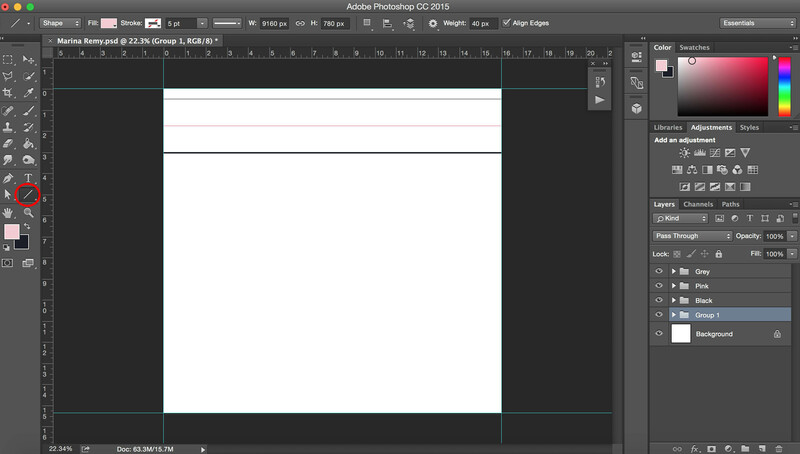 Open up a new document in Photoshop. I always like to start bigger so that I can still scale down in Spoonflower, so I have created a canvas that is 16″ x 16″ at 150 dpi. Start by using the Line tool to create your first colored stripe. As you create your second and third line, use the Selection tool to drag the stripes to your desired distance a part. Photoshop will automatically measure the distance between objects and show you the measurement so it’s easy to ensure that they are equidistant apart. Select all three colored lines in your layers menu and copy/paste them all the way down to cover the remainder of your background. Feel free to crop or edit your background using the ‘Canvas Size’ dropdown in the ‘Image’ Menu if you need to add or remove length. Pro tip: By adding the first three lines to a Group, you can easily copy/paste all three lines at one time. Create a text box and type in the name in your desired font. Drag it to your desired location on the page. It doesn’t matter where you start or decide to place it, but I started in the middle, just a little off center so that I could strategically place the name above and below in a cascading manner. Zoom in close to the name where it meets your line. Go back to your line and copy/paste a version of that same line. 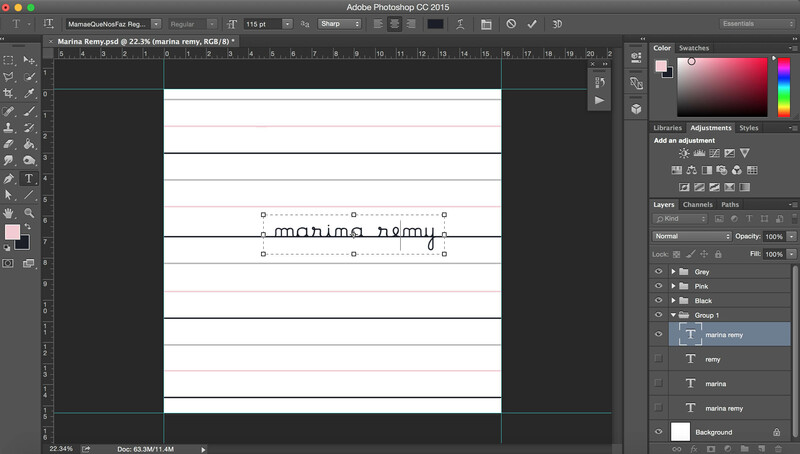 Using the selection tool, shorten the length of both lines so that they just reach the end of the text. 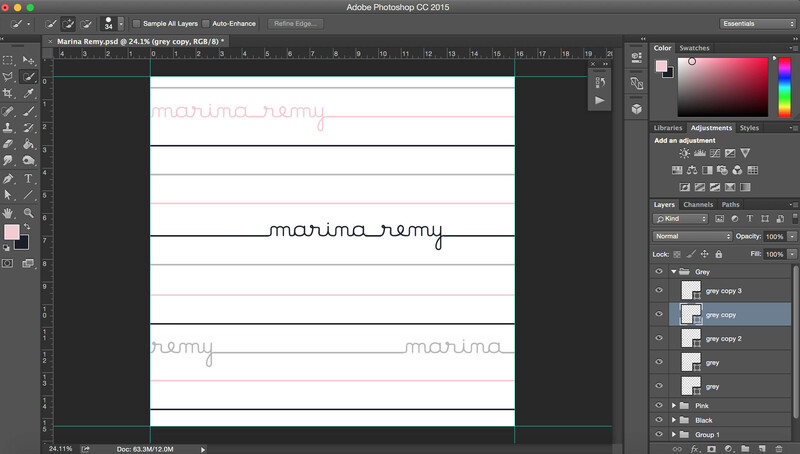 For Marina’s name, there is one line that just meets up to the M, and the other that just starts at the Y. I then created one more copy and also cropped it to join the A and R.
Repeat this process for each color line you have, which for me, was 3 more times. However, due to the staggered look that I was trying to achieve, I split up the first and second name for the final color so that it would look more seamless when it repeats. You may have to go back and move your original 2 text boxes to make it look more evenly spaced. Save your document as a JPG and then upload to Spoonflower! Play around with the DPI to get the size you like, and use the ‘Basic’ repeat functionality to make it look best. 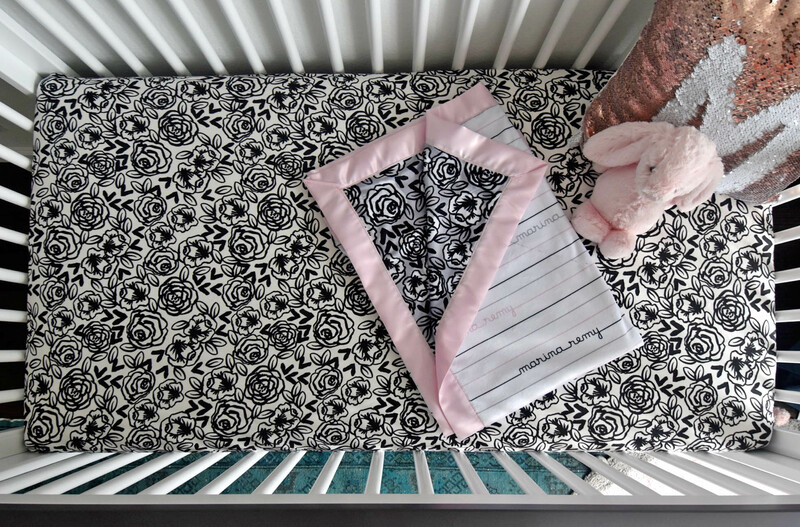 If you are making a baby blanket like mine you only need 1 yard of Minky in the custom name fabric and 1 yard in a contrasting print, so have fun mixing prints and colors to make a unique combination! 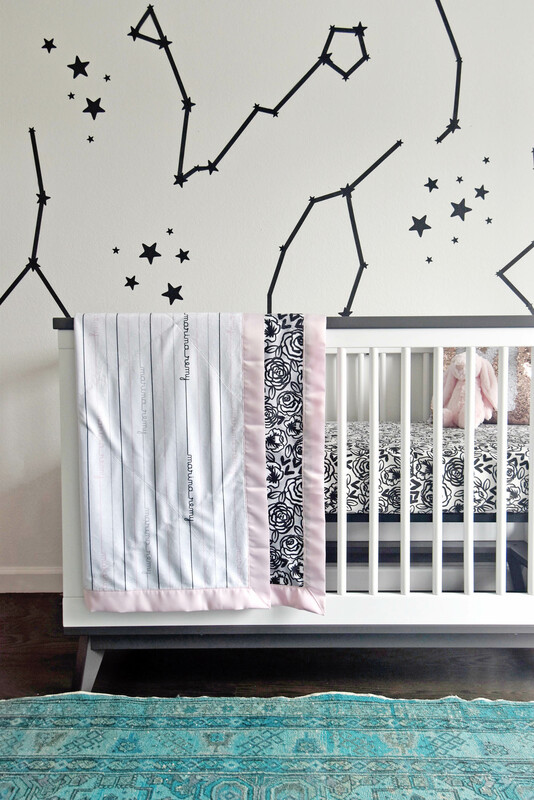 And just like that, you’ve added a personalized touch to your DIY nursery. 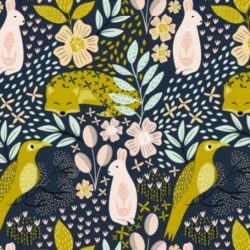 If you’re feeling inspired to design the fabric for the back of the blanket, you don’t want to miss this helpful seamless repeat tutorial using Photoshop. 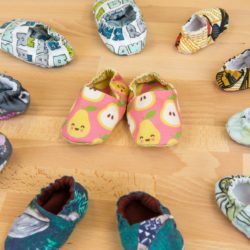 If you give this DIY a try, don’t forget to tag #spoonflower and #stylesafaribaby so we can see how you’ve personalized your Minky! 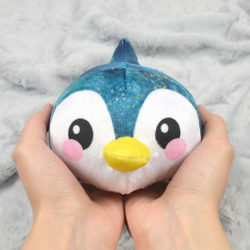 So then Spoonflower will print it on fabric? Sorry, I’m new.